The Wheel of the Year – with not beginning and no end. ‘The cycle of light and dark, of planting and harvest, of leaves budding, opening and falling, is an ever-turning wheel that has no beginning and no end. It rolls through the seasons, changing the landscape, and influencing the things that we do and the way that we feel. Each time of the year is special, with its own particular feelings, smells and atmospheres – and, if we allow it, it’s effect on our lives……’ From the introduction of – Gail Duff’s book – The Wheel of the Wiccan Year. The winter tradition of ice skating at Hampton Court Palace. I enjoyed a very special and lovely holiday season. I spent it with my friends, Gail and Mick in their home in Kent. A home set in the middle of countryside in a place where one can still believe that life hasn’t changed too much. We have known one another since starting school together at five years old….Mick and Gail married and have just celebrated their 50th anniversary. We are all artists. 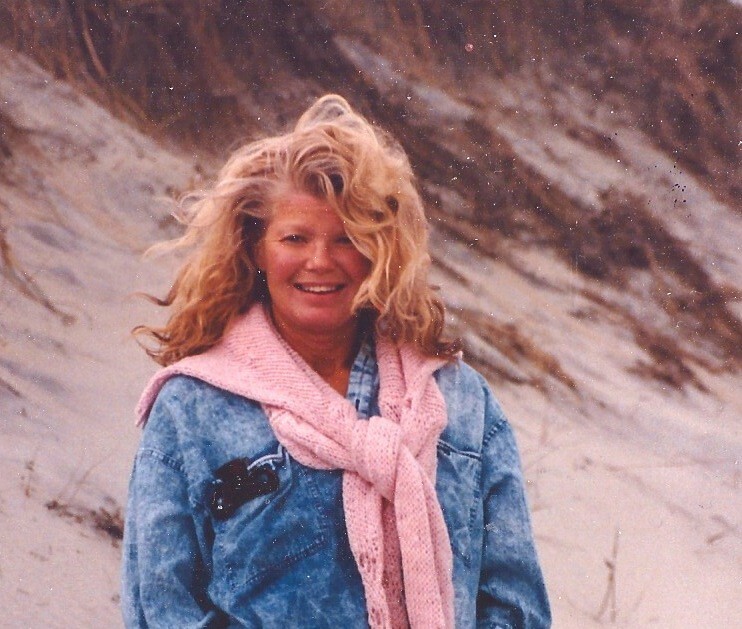 Gail a writer, singer, song-writer – to name a few of her attributes and Mick a photographer, musician. I was invited to their annual Yule celebration on the 21st December – celebrating the winter solstice. A lovely event, considered to be one of the most joyful celebrations of the year. In the evening, friends arrived bearing food and gifts. In their sitting room with the Christmas tree sparkling and candles ablaze there was a wonderfully festive feeling. From Gail’s book – The Wheel of the Wican Year, we learn that Yule is the festival most rich in remembered tradition and ritual. In the early days of Christianity people were reluctant to give up their Pagan path and the Midwinter celebrations. It was therefore decided that the birth of Christ should be celebrated at the same time. This enabled the ritual dramas, songs and decorations to be be continued with Christian meaning. rapid watercolour of their daughter Lucy with violin. For the first time in many years, I enjoyed carol singing. We went from house to house in one of the local villages and it was wonderful. I had forgotten how joyful an experience it is. For Christmas day we enjoyed a Goose with all the trimmings – plus of course plum pudding and Christmas Cake – and it seems to me numerous mince pies and chocolate……This was followed by games and much laughter. On Boxing Day (for the uninitiated the day after Christmas) we went to Leeds Castle, where we walked, communed with the swans, ducks and other birds, and enjoyed the beautiful Christmas trees throughout the castle. Ducks in the moat diving for the seeds. Leeds Castle – during the Solstice – The mid winter atmosphere was perfect. Geese in a row – Leeds Castle Kent During this period, I realised that in so many ways we have lost touch with the rhythms and magic of each season. From a commercial stand point, the large corporations remind us constantly of the next holiday – prompting us to purchase all sorts of unnecessary stuff – which brings me to the big question. Our we still in touch with the emotional and physical effects on our lives that the different seasons bring? A musical celebration in a local pub. A lovely way to spend a mid winter’s afternoon. Given the way we shop and live, we have come to believe that all fruits and vegetables are available at any time during the year. In out techno charged world, there are many who have lost touch with the rhythms of our 24 hour day, let alone the seasons. Our cities are flooded with artificial light, which disturbs our body clocks causing for many a lack of sleep and feelings of well being. How different a place the world would have been for the people in this photograph which was hanging in the pub – and it wasn’t that long ago! All of this has brought to mind, the rapid and dramatic changes that have occurred for all of us during recent years. For anyone interested in learning more about the natural rhythms and seasons of the year, I highly recommend Gail’s book ‘The Wheel of the Wiccan’. Through the book we can learn about the ancient traditions that brought us to the holidays we have today….. There are some that might say ancient traditions are gone – and that we need to focus on the future. These ancient traditions were put in place to protect our natural world and how we live in it and relate to it. I think it is of vital importance that we respect them. Of course, I must close with magical hummingbirds…..a little bird that adheres to the ever changing seasons. This entry was posted in Uncategorized and tagged artificial light, body clocks, Boxing day, carol singing, Celebrating Yule, Christianity merging with Pagan rituals, Gail Duff author, Hampton Court Palace, http://www.janetweightreed.co.uk, http://www.zazzle.com/janet+weight+reed+gifts, ice skating, Leeds Castle Kent, Leeds castle mote, Mick Duff photographer musician, pagan rituals, rhythms and magic of each season, The Wheel of the Wiccan Year by Gail Duff, The Winter Solstice on January 10, 2018 by janetweightreed10. “There is no such thing as chance; and what seems to us merest accident springs from the deepest source of destiny.” Frederick von Schiller. My cousin introducing me to Crickhowell (The Magical Town of Crickadoon) in 1993 – a place I had never heard of before…..was that chance or fate?…….Certainly living and working in Crickhowell for twelve years constitutes a very important chapter of my life, and indeed will always be part of who I am. large self portrait – Crickhowell Wales 2000 – rapid watercolour/gouache Yesterday I visited my good friends Greta and Martin. We met 12 years ago shortly after I moved to London from Wales. It was a Sunday afternoon and I was giving a portrait demonstration for Artslink – a group I had recently connected with. After the demonstration, Greta and Martin introduced themselves and asked if I would be interested in giving a workshop for SOFAP (Fulham/Hammersmith Arts Society) to which I said yes. They also asked if I was related to Carol Weight, who it turned out was one of the early founders of the Society. In fact, Carel was my Father’s cousin. From Carel’s Memorial Service at The Royal Academy. I will always remember that first workshop….because I knew in every fibre of my mind and body that I was in the right place at that moment in time. Subsequently, during the past 12 years, so much of the work I have done and people I have met in London can be traced back to that Sunday afternoon when I met Greta and Martin. Chance or fate? My first portrait workshop with SOFAP – Fulham/Hammersmith Arts – eleven years ago Recently, I have been experiencing a glut of ‘coincidences’ – or are they? Six Degrees of Separation is the term we use to describe such happenings when we meet others for the first time who we find are in some way connected to our lives. When in Portugal, some of the group were scrolling through my work on a pad and came across this painting – which is a ‘symbolic self portrait’ large oil on canvas – painted in my West Chester studio, Pennsylvania 1990. They asked what the different objects in the painting represented. I told them that the little egg cup in the front and centre of the composition represented my birth. That it was given to me, and other babies born in England on 21st January 1946. The silver egg cup has the inscription – News Chronicle Centenary – 21st January 1946 – Janet Weight. At this point one of the group said that their family had owned the News Chronicle….for me a significant moment. Chance or fate ? The egg cup has been a Talisman for me throughout my life….and as I write this, it sits on a shelf in my book case. Claudia Nottale came into my life when she was 17 years old. Introduced through a friend, she came from Paris to live with me and my young family. I knew from the moment I met her that she would play a significant part in my life…and indeed she has and continues to do so. I have painted and sketched Claudia many times over the years…. charcoal when Claudia was visiting Crickhowell in 1995. It has been suggested to me that I write a book about the numerous ‘coincidences’ that have occurred throughout my life….and indeed they will be a part of my book. With the luxury of hindsight I can now look back and pin point how these events have shaped my life. Like a tightly woven tapestry – our lives are intertwined. 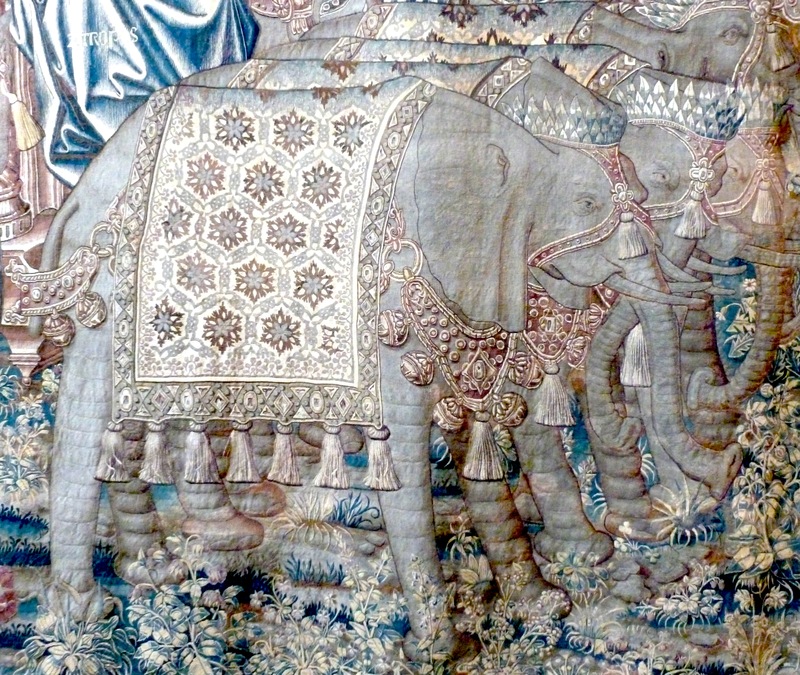 When we look at a tapestry, like this magnificent piece from Hampton Court Palace, we tend to see the main features….but every thread is key to the whole….all of life is interconnected. I am quite clear that when these ‘coincidences’ occur in a glut…that the hummingbirds are indeed weaving their magic….. This entry was posted in Uncategorized and tagged arts link london, carer weight artist, carer weight RA royal academy moemorial service, chance or fate, claudia notable theatre director and actress, frederick von schiller, Fulham/hammersmith Arts society, greta chaffer artist, Hampton Court Palace, Julia dennis artslink, magical hummingbirds, news chronicle centenary, silver egg cup from news chronicle centenary, six degrees of separation...., SOFAP, talisman, tapestry hampton court palace on May 18, 2017 by janetweightreed10. Meeting Stephanie at Hampton Court Palace. I am fortunate enough to live about ten minutes away from Hampton Court Palace, and so when I have visitors, it’s a great place to visit. This was the case yesterday, when I met up with Stephanie, an American friend I haven’t seen for 24 years! 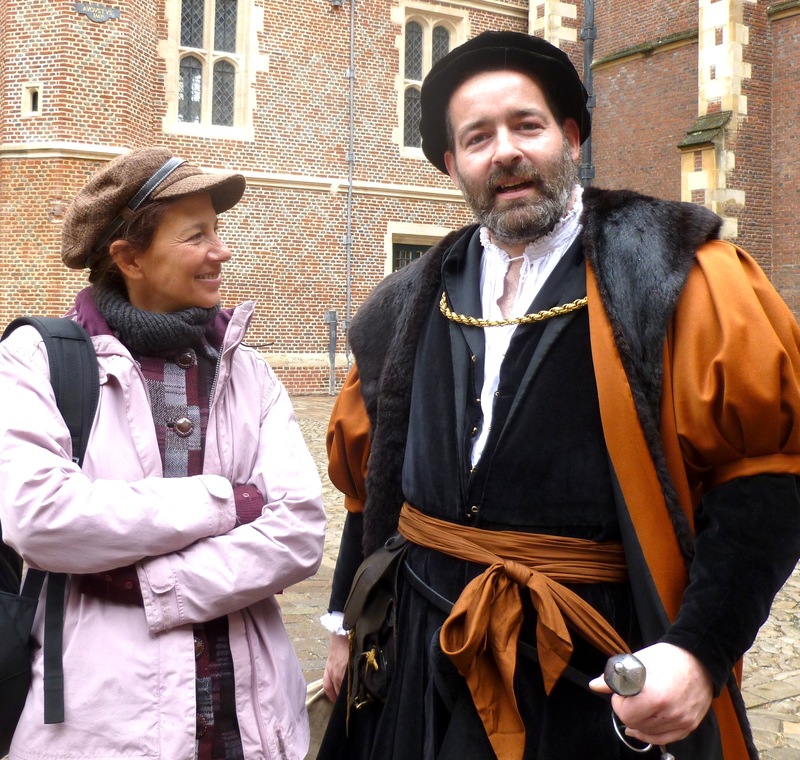 As is so often the case it was as if no time had past at all…..
Stephanie with two of the Hampton Court Palace guides. The gardens are open every day of the year and they are a wonderful place to walk in or indeed sit with a book during the early spring and summer days. This shows a small part of the Palace behind Stephanie, with the unique Tudor chimney stacks. The long shadows talk of a late early spring afternoon. Behind the Palace are these sculpted trees and much more….Henry VIII was apparently very impressed with The Palace of Versailles and wanted the gardens at Hampton Court to have a similar feel…..and I think this was achieved. I will write a separate post one of these days with more of the history surrounding the Palace and the magnificent tapestries that hang in the Great Hall. 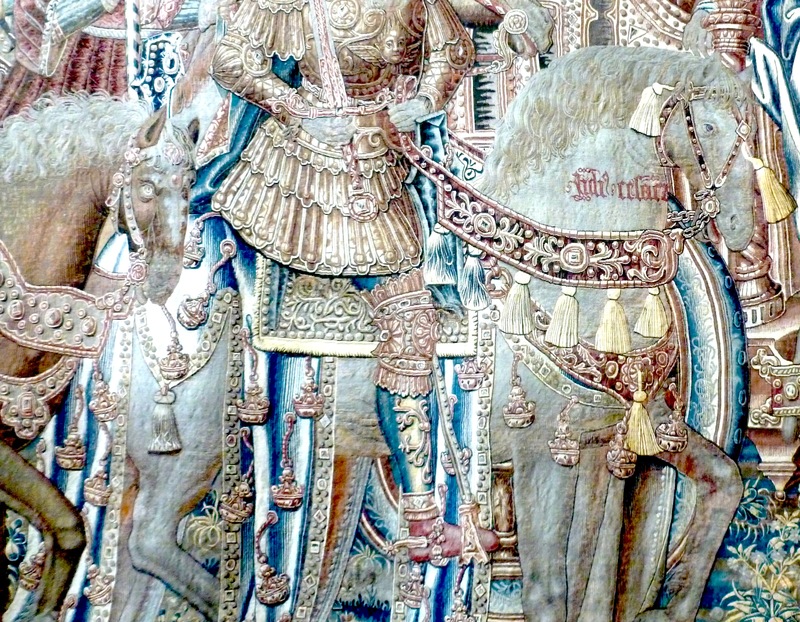 This is a photograph I took of a detail from one of the tapestries. This entry was posted in Uncategorized and tagged Hampton Court Palace, king henry VIII, tapestries at hampton court, the palace at versaaile, tudor chimney stacks on February 19, 2015 by janetweightreed10. Yesterday, I had the good fortune to meet Ratka Bogdan, author of the book Sailboat – Sailing Through the Ocean of Life. Ratka and I met on line through Axlepin Publishing, a platform for writers/poets, painters and photographers from around the world. 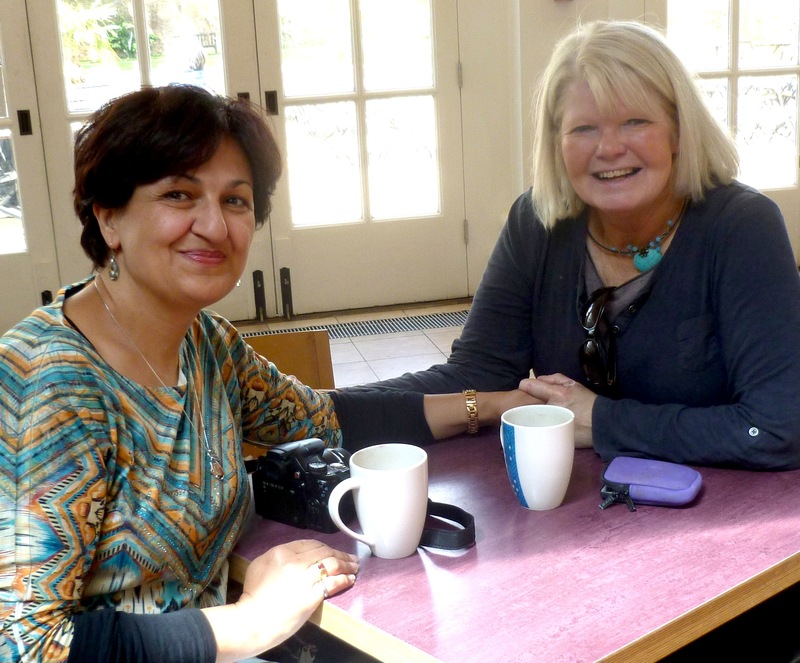 Ratka and her husband were travelling from their home in Florida, and only had a few days in London, and so it was fortunate that we were able to meet for coffee at the Hampton Court Palace gardens cafe, which is very close to where i live. Today, Ratka and her husband fly to Macedonia to see family. I am quite sure we will be seeing one another again. This entry was posted in Uncategorized and tagged Axelpin publishing, Hampton Court Palace, janet weight reed, ratka bogdan writer/poet, sailboat - sailing through the ocean of life, stone henge, weight reed artist on May 13, 2014 by janetweightreed10. For the past week, I have had a close friend visiting from Paris and so we did some local sight seeing. Hampton Court Palace, one of the homes of King Henry VIII, is very close to where I live. 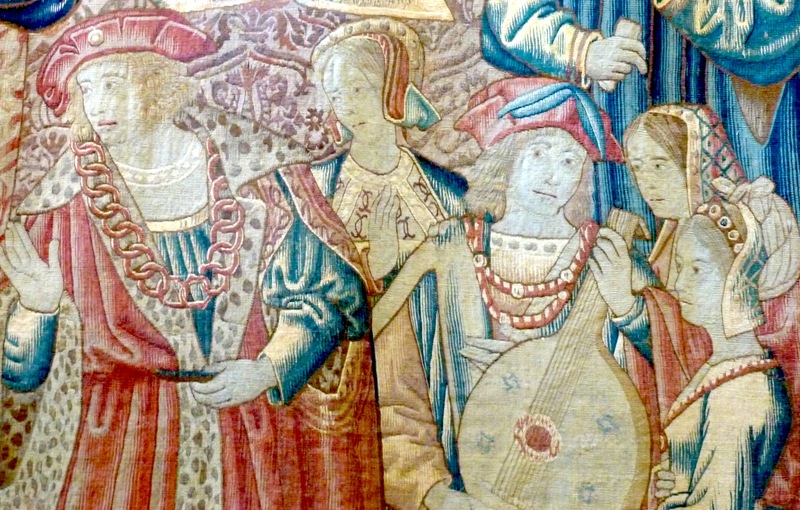 In this post, I will show some details from the ten tapestries in the Great Hall, where King Henry VIII held sumptuous dinners, filled with music, dancing and jest. The Great Hall, Hampton Court Palace where the tapestries telling the story of Abraham, are housed. I am interested in the tapestries as beautiful works of art, and also as possible information for the series of paintings I have been working on for nearly 30 years on the subject of ‘interconnectedness’. The tapestries were commissioned by King Henry VIII to celebrate the birth of his son, Edward, to his third wife, Jane Seymour in 1537. 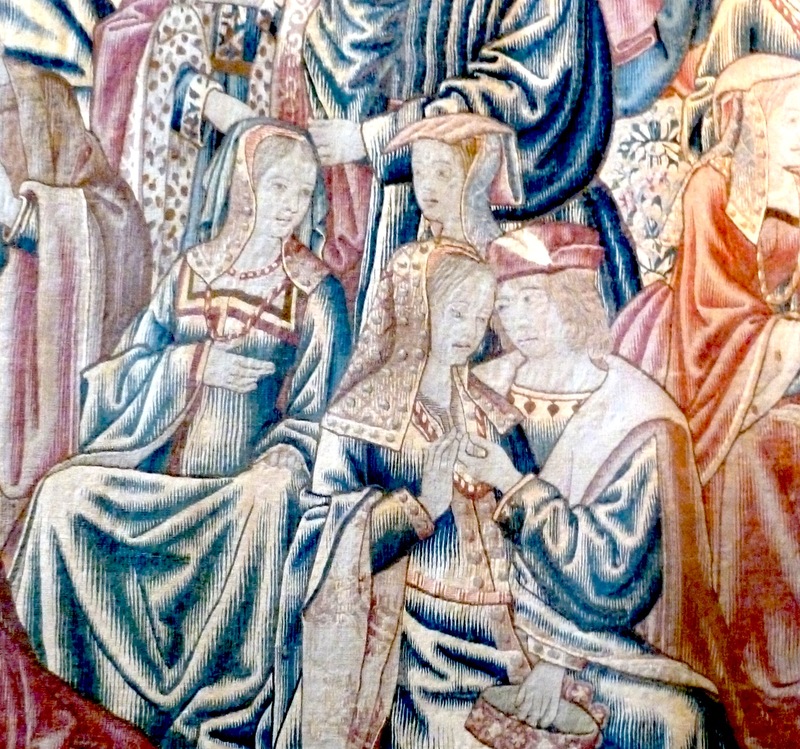 Tapestries were the most highly valued art form of the 16th century. Henry VIII had collected more than 2000 by his death. They were in fact a display of great wealth. Note the movement in the horse. It is often assumed that tapestries are made by women, but in fact during the 16th century this was the work of highly skilled men who had been trained from a very young age. The work began with a small painting known as the ‘Petit Patron’ – This is enlarged by the designer into a full scale cartoon. The value of a tapestry was determined by the artistic quality of the cartoon, skill of the weavers and the density of weave. The tapestries in the Great Hall, are interwoven with sliver and gold thread…. I am always aware of the interconnection when viewing work from previous centuries…..
As we walked around the Palace we bumped into one of the courtiers. Claudia and courtier. Claudia returned home yesterday after what was a very special week together. 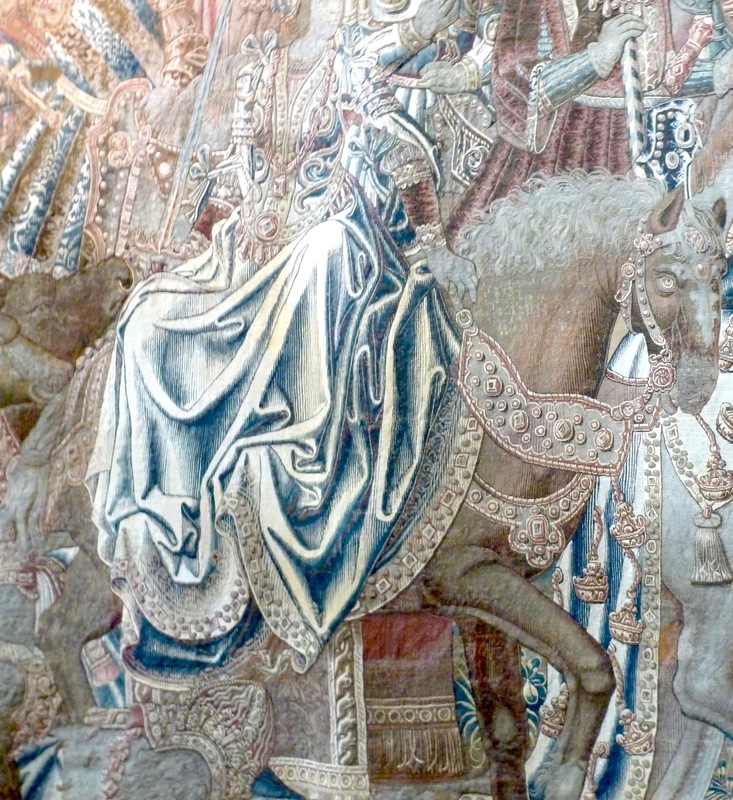 This entry was posted in Uncategorized and tagged Claudia Notalle France, Claudia Notalle workshops France, great hall hampton Court, Hampton Court Palace, interconnections, jane seymour wife of King Henry VIII, janet weight reed, king henry VIII, story of Abraham, tapestries Hampton Court Palace, weight reed artist on May 6, 2014 by janetweightreed10. I am very fortunate to live in a lovely part of London…I might add in a modest, one bedroom flat, however the area is fabulous allowing for the best of all worlds. This photograph (not mine) was taken in Bushy Park this past week…. I mentioned in yesterday’s post that Hampton Court Palace was just five minutes from where I live. Bushy Park, sits immediately north of the Palace andy in the 16th century it was King Henry VIII’s deer hunting ground. The roaming herds of Red and Fallow deer that populate the park today are ancestors of the deer that Henry hunted. Bushy Park is the second largest of London’s eight Royal Parks, and I for one am so grateful for these beautiful places that are protected by the Crown. Living in London, or visiting the Capital can sometimes be overwhelming, and so to enjoy and visit these Parks is indeed a respite. Covering 1,099 acres, Bushy Park can be accessed from Kingston, Teddington and Hampton….On the Hampton side, there is a heated swim pool that is open 12 months of the year, and the park has lakes, a river water gardens, meadows and so much more. For visitors to London, you can take the train from London Waterloo to Kingston, Teddington or Hampton. There are also plenty of buses from Kingston to Hampton Court Palace, and it’s all good walking country. I wish everyone a beautiful weekend. This entry was posted in Uncategorized and tagged busy park london, Hampton Court Palace, janet weight reed artist, king henry VIII, kingston upon thames, red and fallow deer, royal parks london on December 14, 2013 by janetweightreed10.